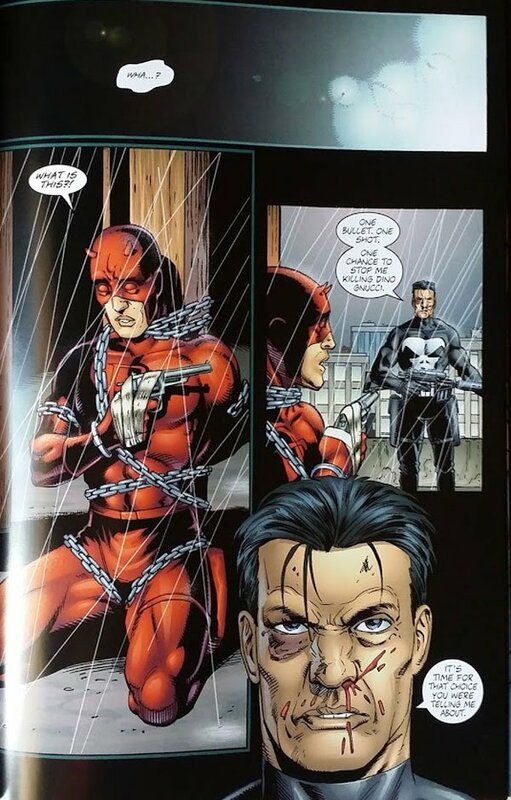 In the third issue of Ennis' run on Punisher comics, Frank Castle manages to incapacitate Daredevil during a battle, specifically by using a high pitched sound blasted over a local loudspeaker system. When the Man With No Fear wakes up, he discovers that he's been tied to the post of a water tower on a roof, and has a gun taped in his hand - which is strapped to his chest. The pistol is pointed straight at Punisher - who explains that he is about to assassinate a mob boss with a sniper rifle, and that if Daredevil wants to stop him, he'll have to kill him. Because I don't want to potentially spoil the show, I won't tell you what ends up happening. Coming up in Daredevil Season 2, we know that Jon Bernthal's Punisher will be introduced in the very first episode, and that the entire pace of the show will be a lot quicker - taking advantage of all the exposition and setup that was completed in Season 1. Basically, we can expect the moralities of Daredevil and the Punisher to start clashing immediately, and probably last through the entire 13 episode season. We don't specifically know what comic book inspirations new showrunners Doug Petrie and Marco Ramirez are working from, but our fingers are crossed that Garth Ennis' Punisher books will be influential. The second season of Daredevil will see the return of Season 1 stars Charlie Cox, Deborah Ann Woll, Elden Henson and Scott Glenn, and in addition to introducing Jon Bernthal as The Punisher will also feature Elodie Yung as the notorious Elektra Natchios. Sadly, a specific release date has not yet been revealed, but it's expected some time in April.